The closest beach is 700 m away. The property is 500 m away from the coast. The town center is 10000 m away. Airport - 88 km. Train station - 68 km. Ship / ferry port - 10 km. Closest infirmary/hospital - 10000 m. Closest public transport (bus etc) - 10000 m. Grocery store - 1000 m. Closest restaurant - 300 m. Nature park - 222 km. National park - 168 km. Instant booking unit Type of studio apartment: SA Maslina 1. The studio apartment has 2 bed/s for adults. There is/are 1 extra bed/s. Capacity (adults) is (2+1). It has 3 star/s. Studio apartment has 55 m2. It is on the ground floor. Kitchen, living room and beds are in the same space. Flooring: tiles. In the studio apartment is/are extra bed/s one couch/sofabed for one adult, one couch/sofabed for two adults. Bathroom has 9 m2. In the bathroom is the next equipment: shower, toilet, washing machine, tiles, hairdryer, bath towels. Balcony of the studio apartment has 20 m2. 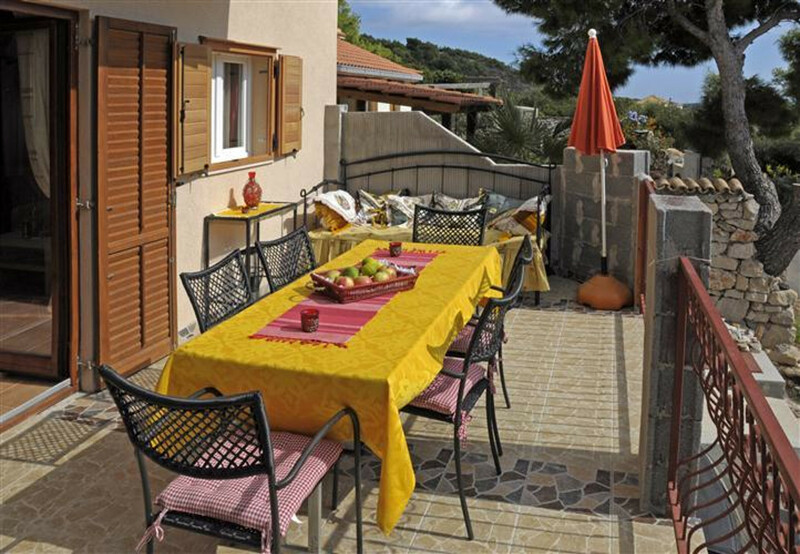 Features and equipment: seating set, partly covered, partly sea view, garden view. Instant booking unit Apartment type: A Maslina 2. The apartment has 4 bed/s for adults. Capacity (adults) is (4). It has 3 stars Apartment has 65 m2. It is on the first floor. Number of bedrooms: 2. Number of bathrooms: 1. Number of balconies: 1. Flooring in the bedroom parquetry. In the room is two single beds. The bedroom has an exit to the balcony. , Bedding is available to guests. TV set, SAT-TV, DVD player, smoking allowed inside the apartment , air conditioning in the hallway (included in price). Kitchen sink, hob with two cookers, electric hob, refrigerator, freezer, microwave. The bathroom has 8 m2. In the bathroom is the next equipment: shower cubicle, bath tub, toilet, tiles, bath towels. Balcony/teracce of the apartment has 10 m2. Features and equipment: covered, seating set, partly sea view, garden view.